Hello from Howard County, Maryland! When my husband and I moved here 31 years ago, this was a very rural community with lots of farmland behind us. Our three acres are mostly wooded and it was a great place to raise our kids. They had a big yard to play ball, a long driveway to ride bikes, and those great woods to build forts. Someone who lived in the house before us had some chickens and a ramshackled coop was in the corner of the property. Hmmmm... that is a good idea! But my husband wouldn't go for it. As it turns out, he was probably right because like all parents, we were busy all the time! Fast forward. Our kids are grown, and we are suffering empty nest. (I keep saying WE, but mostly it is me.) A friend was supplying us with her fresh eggs and was my inspiration to try one more time to convince hubs to get some chickens of our own. 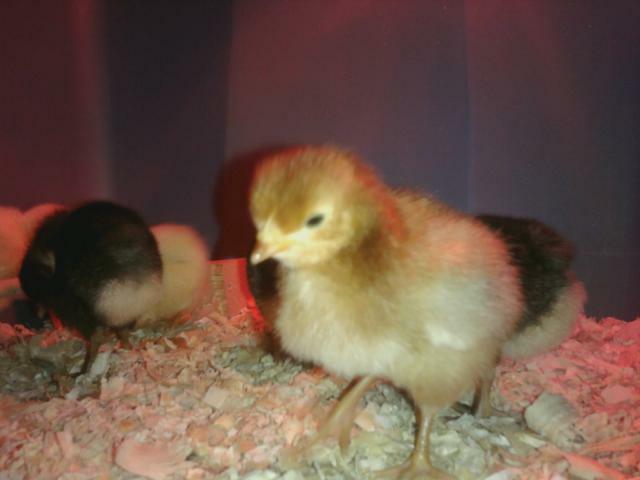 This time it worked, and so our chicks came home on May 9, 2011. We have eight chickens. 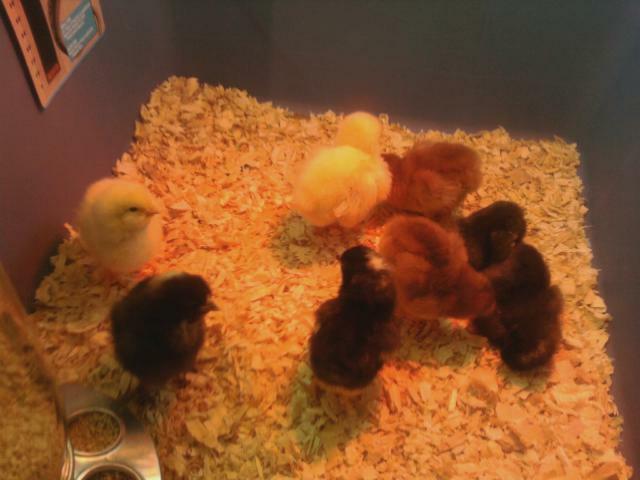 Two are Rhode Island Reds, two are Columbian Rocks, and four are Barred Rocks. I couldn't figure out how to rearrange the pictures on the page, but I'm sure you can tell they are out of order. I would like to mention that the run is not just the welded wire. We put a second layer on it of chicken wire and used hardware cloth to skirt the ground outside the run. That then is covered with rocks and broken tile that we reclaimed from our bathroom renovation project. The run also has a peaked roof (a tall post in the center with a crosspiece on top) of a double layer of chicken wire and a heavy duty tarp. The floor of the run is sand which I rake on the weekend. 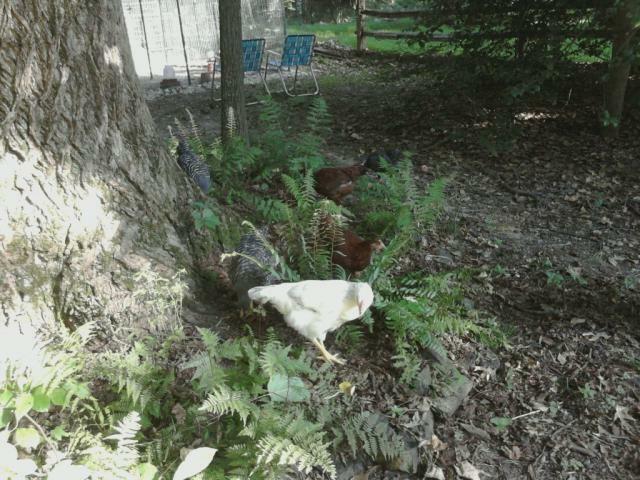 The chickens spend most of the afternoon roaming around the yard eating bugs. They have become quite adventurous and have decided the bugs are bigger on the other side of the fence. Now their new trick is to hop up onto the fence and check things out. 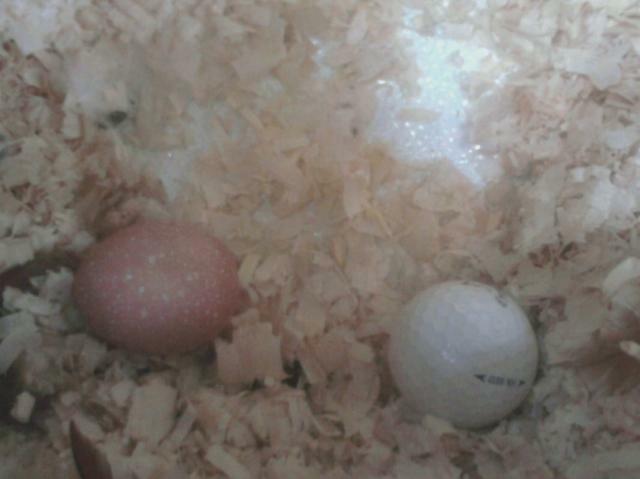 The first egg came today, Sept 22, 2011. So excited! Meet Cagney...the pullet (below right) the one who laid the egg, I'm pretty sure. 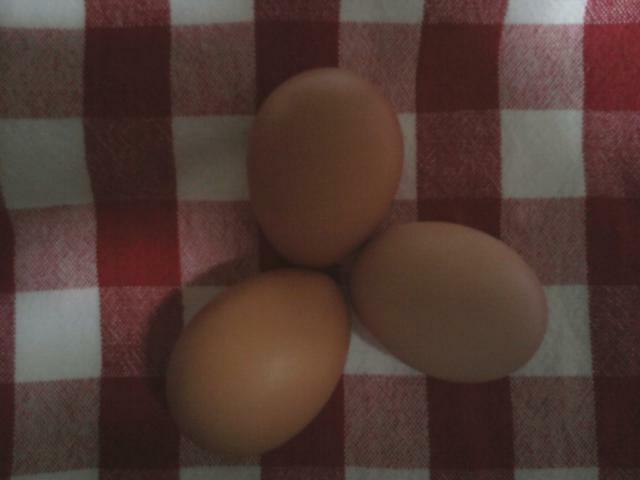 A Three Egg Day~ woohoo!! !